As you get older, your immune system weakens. Therefore, you don't have as high an antibody response after receiving the traditional flu vaccine to help your body fight off the flu. 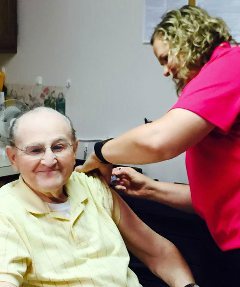 Fluzone High-Dose vaccine is made for people 65+ to help promote a stronger immune response to the flu than a regular flu shot. Fluzone High-Dose vaccine is significantly more effective than Fluzone vaccine in preventing the flu — 24.2% more effective. It has 4 times the antigen of a regular flu shot for a stronger immune response to the flu. This helps protect those 65+ from the flu and the dangerous complications that can come with it. Common side effects of Fluzone High-Dose vaccine. Fluzone High-Dose vaccine is given by an injection (shot) in the arm. You may have pain, swelling, and redness at the injection site; fever; headache; fatigue; and muscle aches. Other side effects may occur and usually disappear within a few days. If they don't, please contact your doctor. There are different types of flu. Fluzone High-Dose vaccine helps protect against the flu virus strains (subtypes A and type B) contained in the vaccine; however, vaccination with Fluzone High-Dose vaccine may not protect all individuals. Flu complications can be especially devastating when you're 65 or older. Up to 90% of flu-related deaths and 60% of flu-related hospitalizations in the U.S. occur in people 65 or older. That's why it's important to take extra precautions to help protect yourself. Fluzone High-Dose vaccine may be covered with no co-payment or deductible under Medicare, Medicare Advantage, and private insurance policies.